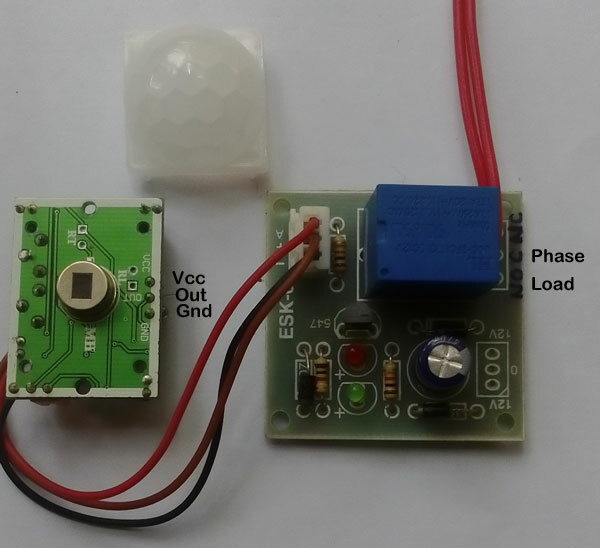 What is inside the PIR Sensor Module? The PIR module is a fully assembled board with a current sourcing output which can be used to trigger a circuit. 1.Fresnel lens – The PIR sensor is covered externally by a dome shaped plastic cover which acts as a Fresnel lens to concentrate the Infrared to the sensor. It is built of tiny lenses that collect IR from different angles. 2. PIR Sensor – Inside the Fresnel lens cover, there is PIR sensor soldered in the module. It is the chief part of the module to receive the IR. 3. Connector pins – PIR Sensor module has three pins. Vcc that receives 3-12 V DC, Ground and the output pin. PIR sensor module very well works in 3 Volt DC but it handles up to 12 volt DC. 4. Potentiometers – Two Presets are provided to adjust the Sensitivity ( Range) and the Time delay of the Sensor. The Sensitivity ( Sx ) can be adjusted to few cms to 10 meters. But good sensitivity is available in the midpoint of the preset. Time delay preset (Tx) adjusts the time period by which the output remains high. The Module has a timer circuit so that the output On time can be adjusted between 30 seconds to 3 minutes by turning the pot. When we place the Module down, the Preset close to the IC is Sx and the right one is Tx. 5. Re trigger Jumper – PIR Module has a Jumper to select two modes of operation. The Default setting may be in the “H” position. In the H position, the PIR sensor triggers only when a movement is sensed. In the Non retriggering mode, the Jumper is placed in the “L” position. In this mode, repeated triggering occurs when it detects movements. The “L” positing seems little erratic and output turns high and low repeatedly. So use the “H” position for stable operation of the circuit connected to the Module. How to Fix the circuit. The finished gadget should be placed on the wall above 2-3 meters from the ground level at an angle of 45 degree. This makes a 45 degree field of view to the ground. Direct Sunlight should not fall on the Sensor. It may cause false triggering. Moving tree branches, sudden fluctuations in temperature and sunlight, fluorescent lamps etc may cause false triggering. 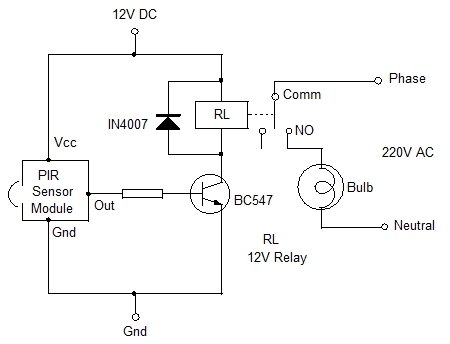 Note : It is better to uses a Transformer power supply for error free working of the PIR sensor Module. 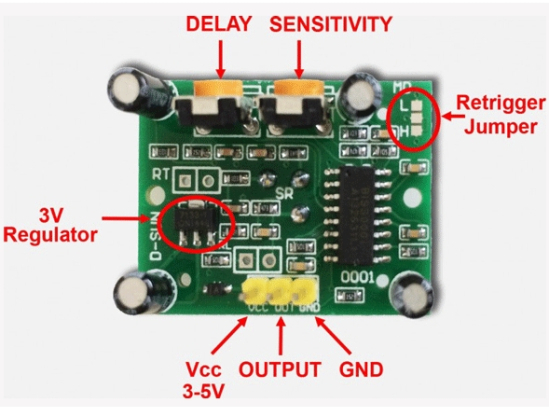 Use of Transformerless power supply and cheap SMPS power supply may cause erratic working of the Module. The transients in the Mains lines may cause false triggering.